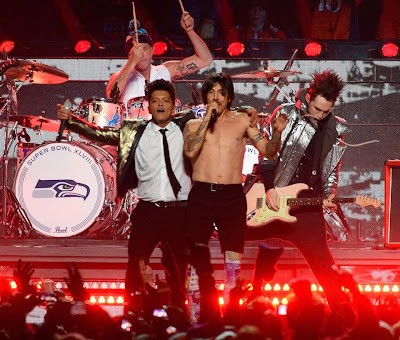 The Red Hot Chili Peppers joined Bruno Mars at the Super Bowl 48 halftime show in New Jersey on Sunday, and video from the event is available. The custom Pearl drum set used by Chad Smith during the performance is available for bidding as part of an NFL auction for charity; proceeds from the set will benefit Make-A-Wish America. In addition, three pairs of autographed drum sticks used by Chad are also available at NFL Auction. Bids are open until 10 PM EST on February 7; check out Chad’s gear here. Many items are a part of the auction, including signed jerseys, helmets, footballs and photos by current and former players and coaches. For full details, visit NFL Auctions here. Red Hot Chili Peppers issue new song for Super Bowl? Red Hot Chili Peppers to play Led Zeppelin classic at Super Bowl?